Early twentieth-century Russian painting innovators followed in the wake of their Western contemporaries’ artistic discoveries, but they strove passionately for independence and originality. The breakthrough was made by Kazimir Malevich, who first created wholly abstract compositions. 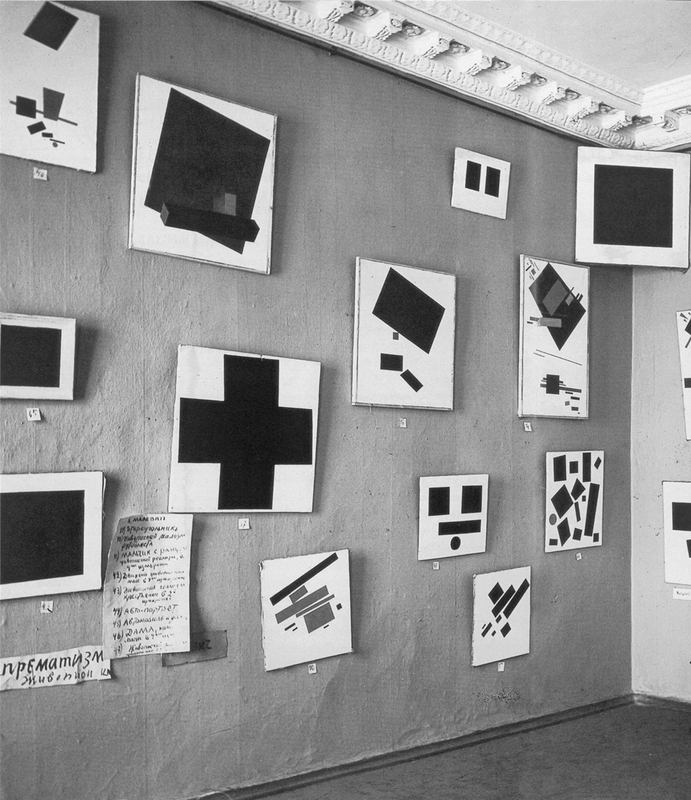 His most famous work, Black Square 1915, became a universal symbol of a new era in art. A few words about the artist’s biography: according to new information, Malevich was born not in 1878 but in 1879, in Kiev, to a Polish family; he died in Leningrad in May 1935 from a serious illness that prevented him working during the last year of his life. He did not emerge as an avant-garde painter until 1910, when he was over 30, meaning that his career spanned only a little more than two decades. During this brief time, Malevich was effectively an entire contingent of artists, each of whom had the first or definitive word in many spheres of artistic culture. In painting, any one of Malevich’s artistic periods after 1910 - be it his first series of paintings of agricultural workers, his Expressionist Neoprimitivism, or Cubo-Futurism - would have guaranteed him a place of honour in the history of Russian art. While everything that happened in 1913 and afterwards - his set design for the Futurist opera Victory Over the Sun, the alogical painting of what he called Fevralism, Suprematism, the ‘planits’ [Malevich’s idea of man-made planets], his visionary architectural models the ‘architectons’, the post-Suprematist painting - each on its own would have secured him an unrivalled place in the history of world art. It was his work on Victory Over the Sun that gave rise to his first personal ‘ism’, Alogical Fevralism. Speaking at a debate in February 1914, the artist announced that he had ‘rejected reason’. The Fevralist was now placing his bets on irrational ‘sensation’. Freed from objective representations, this would lie at the heart of the new art and, through it, a new world view, and could rest only on phenomena that were purposely not subject to the distorting directives of human reason. Malevich, born the same year as Albert Einstein (1879-1955), perceived these phenomena in physical manifestations such as electricity, Röntgen rays and gravitation, which reigned invisibly in space and time. In spring 1915 the solar symbolism of Victory Over the Sun took on new meaning for Malevich. In addition to its ‘desconstructivist’ (his own term) objectives, the Futurist masterpiece was discovered to have utopian-constructive potential, which the painter linked to the energetic essence of universal processes and their invisible incorporeal might. Henceforth, the Russian avant-gardist would consider embodying nature’s true (read, abstract) being to be the goal of both his own art and art as a whole. Malevich included the expression ‘partial eclipse’ in his works during his Fevralism period, such as Composition with Mona Lisa 1914. The Black Square of 8 June 1915 marked the “total eclipse” that had long been maturing in his art. The black rectangular plane definitively crowded out the natural celestial body that had ensured the sensory perception of earthly reality. It shifted its creator to another - purely speculative - dimension. 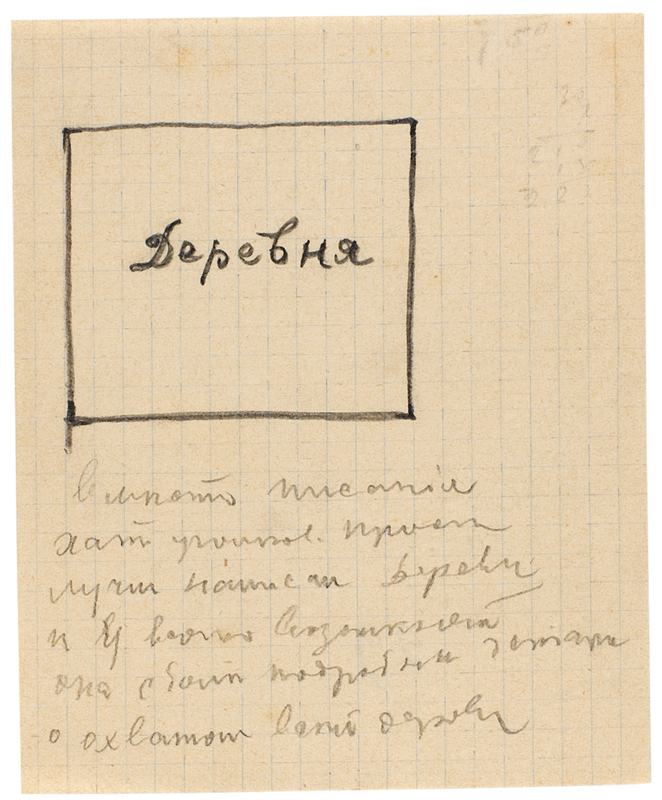 ‘A system is being constructed in time and space; independent of any aesthetic beauties, experiences, moods, rather [it] is a philosophical colour system for realising the new achievements of my ideas as cognition,’ Malevich wrote in the preface to a 1919 group exhibition in Moscow. Subsequently, in his theoretical works he expanded several times on the unitary nature of the universe’s spaces and ‘the infinite space of the human skull’. Malevich called his abstract compositions Suprematism, which in its first stage meant the dominance of colour energy and its transformations in painting. For him, the life of colour as such was indissolubly linked to the universe: object-less colour generated the sensation of its object-less, image-less being. According to Malevich, the ‘white abyss’ of the background, whose whiteness was conditioned by the extreme incandescence of energetic tension in the universe, was the manifestation of space on Suprematist canvases. In late 1917 the painted elements became increasingly dynamic. Their sharp edges cut into the whiteness, and as the concentration of colour decreases, the boundary between figure and background disappears. Each shape has a real type of time and the coloration of colours is the power of the time’s oscillation, time’s movement creates shape while simultaneously colouring it and consequently the speed of time can be defined by colour. Like Black Square before it, Suprematist Composition: White on White 1918 was created over an existing painting. The white square on the white background was a symbol signifying the move of an author transformed by transcendence into the “white world order”. 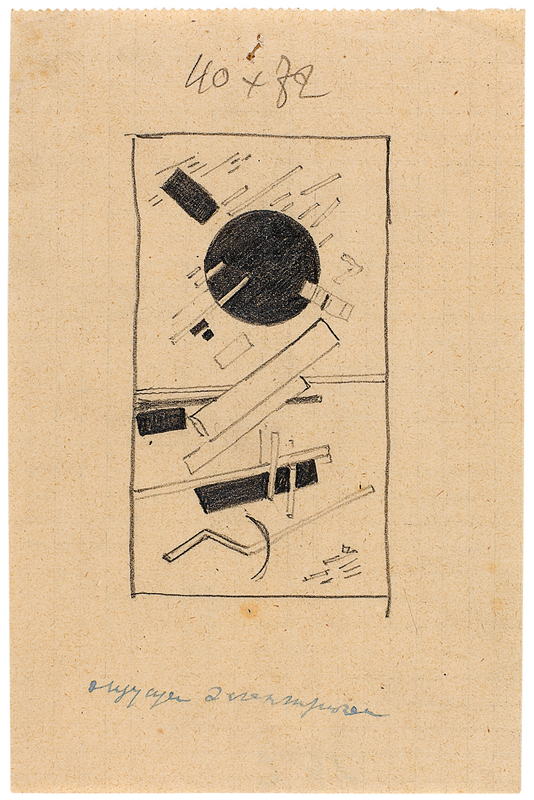 In Malevich’s everyday life, his proclamation of the inevitable break from earth and speculative mastery of space turned into a passionate immersion in astronomy. During his Vitebsk years (1919-22), he was never parted from his pocket telescope, constantly observing and studying the starry sky, the map of which he knew thoroughly. This engendered one of his most astounding texts, Suprematism: 34 Drawings, published on 15 December 1920 with its prophetic lines in the introduction about humanity’s cosmic future. It was here that he gave the ordinary word ‘sputnik’ - Russian for companion or fellow traveller - the meaning that made it famous. As we know, ‘sputnik’ has existed in all the world’s languages without translation ever since the call signs of an artificial, man-made celestial body went out on 4 October 1957. The Suprematist machine, if it can be put that way, will be single-purposed and have no attachments. A bar alloyed with all the elements, like the earthly sphere, will bear the life of perfections, so that each constructed Suprematist body will be included in nature’s natural organisation and will form a new sputnik; it is merely a matter of finding the relationship between the two bodies racing in space. A new sputnik can be built between Earth and Moon, a Suprematist sputnik equipped with all the elements that moves in an orbit, forming its own new path. In these last words one cannot help but recognise the space stations so familiar to us today, which truly are ‘new sputniks equipped with all the elements’. For many years, Malevich the theoretician used astronomic terms while studying the culture of contemporaneity. Tools borrowed from the astronomic discourse seemed to bolster and strengthen the strict universal law that he believed served as the foundation for artistic creation. The great generator of plastic ideas labelled his architectural models, or architectons as they were called, with Greek letters the way astronomers label the constellations. 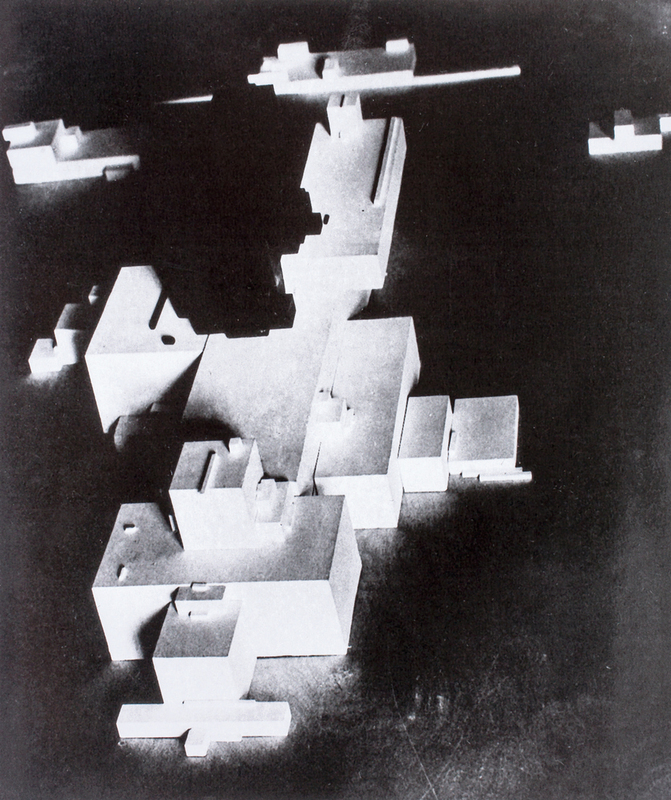 His architectons (alpha, beta, zeta) were also the earthly precursors of a new architecture; they were supposed to be transformed into ‘planits’ - installations soaring into space and inhabited by ‘earthlings’. ‘Planits for earthlings’ were on a par with the planets and stars in the universe. The designs and neologisms Malevich created for them neatly accentuated Suprematism’s cosmic vector. The Russian avant-gardist was not only a great artist, he was also a keen thinker and subjected recent movements - Impressionism, Cubism, Futurism - to theoretical research. These were all retrospective analyses, as he strove to understand the sources of his own achievements in art. But he was fated to know only in part what he had created, produced and engendered in his own lifetime. The entire twentieth century would go on displaying things that came into the world via Malevich in new contexts and interpretations. Many phenomena that appeared for the first time in his work were only picked up on years later. For example, people have quite rightly seen the simple, singular shapes of the Suprematist protofigures as harbingers of the aesthetics of minimalism in the second half of the century, while his white on white canvases resonate, for example, in the monochrome works of Yves Klein. His true recognition did not come until the 1960s, but the discoveries that brought fame to his successors already existed in the Russian’s work, seemingly having settled for the time being in the collective artistic subconscious. His first one-man show, ‘Kazimir Malevich: His Path from Impressionism to Suprematism’, opened in Moscow on 25 March 1920. 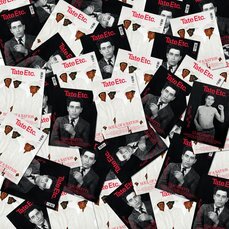 Following the white on white works, it ended with empty canvases that seemed to hurl man into the space of pure speculation, standing him in front of a clean screen on which he was free to project his own ideas within the broadest range. The artist-philosopher was bewitched by ‘emptiness’, which contained everything and spoke of the presence of the Absolute (God). He expressed his astonishing intuition as well in about 1924, on the clean flyleaf in his notebook, where a line appeared: ‘the goal of music is silence’. It’s hard to get away from the thought that John Cage, who in 1952 created his famous silent opus 4’33”, found an extraordinarily effective way to realise this idea, which was, in fact, a favourite notion of the twentieth-century arts in general. However, Malevich was able to embody it more than once, and by quite various means, which in and of itself speaks to the great inventiveness of his talent. For his Black Square was the Zero of forms, his empty canvases were the Zero of forms, and his ‘the goal of music is silence’ was the Zero of forms. Malevich, sponsored by Amsterdam Trade Bank and Blavatnik Family Foundation, Tate Modern, 16 July - 26 October 2014. The exhibition is curated by Achim Borchardt-Hume, head of exhibitions, and Iria Candela, curator, international art, with Fiontan Moran, assistant curator, and organised by Tate Modern in collaboration with the Stedelijk Museum, Amsterdam, and the Art and Exhibition Hall of the Federal Republic of Germany, Bonn. Aleksandra Shatskikh is the author of Black Square: Malevich and the Origin of Suprematism 2012 and Vitebsk: The Life of Art 2007. Translated from the Russian by Marian Schwartz.